Kundan Jewelry - Old style but not old-fashioned! Gold is associated with its glitter and diamond with its sparkle, but when it comes to Kundan, the first thought that comes to mind is - colorful elegance. Kundan craft jewelry is one of the best and shinning examples from the magical box of Indian jewelry styles. 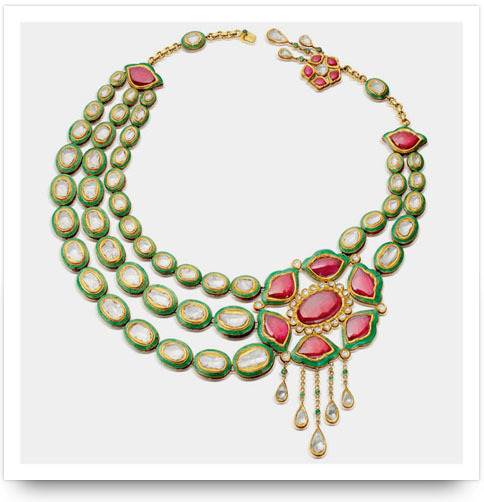 Kundan, ruby and pearl necklace (by Minawala) set with fine enameling work. Wonderful contrast created by use of enamel is beautifully complementing pearls and diamonds. It's the narration of rich Indian history with excellent and fine craftsmanship of traditional Indian jewelry, which the western world has always appreciated. This jewelry-making technique comes from the days when diamonds were hand-cut and hand-studded with the help of very basic tools. Origin of this craft can be traced back to cultural-rich soil of Rajasthan while being at pinnacle during the Mughal era. So, if by any chance you own an antique kundan piece, secure it very dearly as it's priceless. It's a heritage art that you must feel proud of. I have always been enchanted by antique jewelry and craftsmanship and this is what has created a special place in my heart for Kundan jewelry. In my opinion - and I am sure no one will disagree with it - a kundan-styled jewelry is truly magical and mystic with the way it's set and finished. 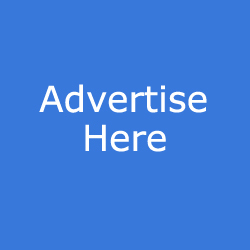 How is Kundan Jewelry made? If you search about this jewelry-making technique on web, you will find multiple descriptions and believe me no two explanations will be same. So, I'll give you the very basic and simple explanation for your clear understanding. Kundan-crafted jewelry is made of natural uncut diamonds studded in 22 karat gold. It's the beautiful combination of semi-precious and precious stones - including pearls as well. Mix of uncut diamonds and other gemstones woven into detailed patterns (with flowers, leaves or animals motifs), produce a wonderfully bold yet very feminine jewelry. At times uneven large pieces of diamond with frosted surface called "Polki" are also used in kundan jewelry. Fine, thin hand-beaten gold sheets act as holders or containers and each uncut diamond is fixed into it with a natural resin called "lac". Molten gold (kundan) is then poured into the empty space around stones which further hardens the lac. Diamond is then slightly pushed to fix it permanently. This setting process is not as simple as it may seem to be. It's actually a very detailed work done by highly-skilled and specialized craftsmen, and pass through several stages of making process before emergence of a splendid piece. Earlier, craftsmen were quite particular about holistic beauty of a jewelry piece, therefore they used to decorate the backside of jewelry too. So, to give the final finishing touch to kundan piece, "meenakari" was done on the backside of jewelry. It's the technique of fine and intricate enameling on metal surface with variety of colors used to make it appealing and vibrant. 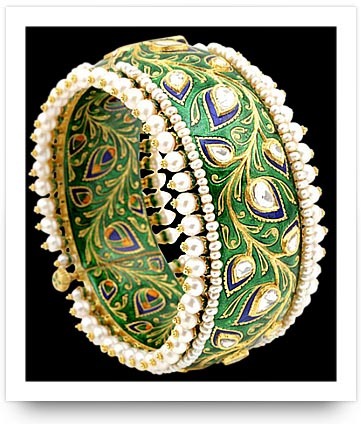 You can easily find meenakari work on the reverse side of modern kundan pieces as well. This vintage "hasli" (collar necklace) not only looks beautiful from front, but the fine meenakari (right image) makes it equally enthralling from backside too. It can be easily worn both ways with two different looks from same piece of jewelry. However, remember that meenakari was not the essential part of kundan jewelry - rather it was just a finishing touch. So, don't assume a vintage kundan piece without meenakari work as "fake"! Kundan jewelry looks elegant when paired not only with traditional outfits but with contemporary and even minimalistic clothing too. Undoubtedly, its tempting tone can add femininity to your personality while evoking a feeling of rich elegance. Kundan necklace adding grace to not-so-traditional outfit. When we are talking about kundan jewelry it is inevitable to mention Sunita Shekhawat. As a jewelry designer, she has brought the regal kundan and meenakari jewelry outside the royal territory. Fine and sharp detailing in her work makes it one-of-a-kind. Notice the play of colors in enameling, and how two-sized white pearls in this bracelet impart a captivating contrast to the vibrant center. 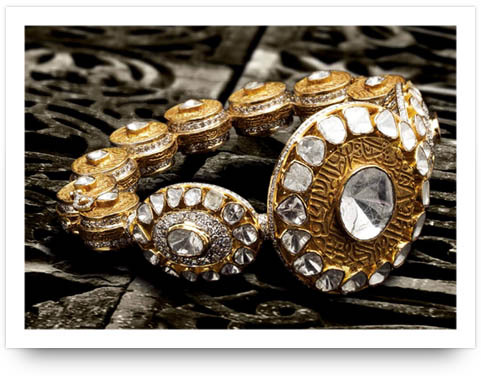 These bracelets or hand-cuffs by Sunita Shekhawat are traditional, but can easily go with modern dressing. You can pair them up with a little black dress to pep-up your formal dressing. Sunita Shekhawat’s jeweled hair-comb (left image) is capable enough to bring out the most stylish side of you. 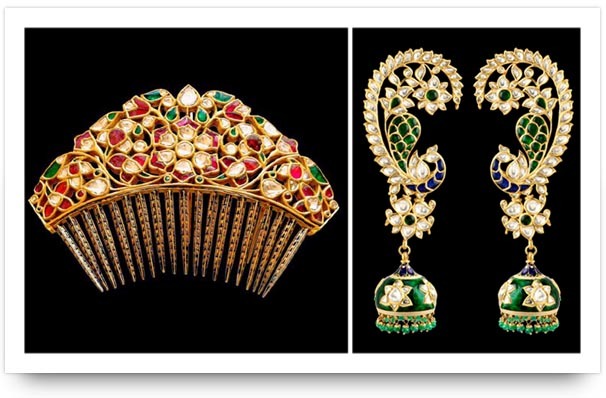 Pair these elaborate earrings (right image) with a salwar-kameez or a sari and you won't feel any less of a princess. Indian bride's trousseau is incomplete without the presence of kundan jewelry, and keeping this in mind more and more Indian jewelry houses are coming up with kundan-inspired collections. Buyers have the choice to pick from completely traditional pieces to ones with trendy flavor. Mainstream jewelers as well as contemporary designers are blending small cut-diamonds with big uncut diamonds and using metals other than gold to create unique designer pieces. Amrapali, Anmol, Minawala and Tanishq are some of the many jewelers who have been launching kundan wedding collections. Superbly-crafted contemporary hoop earrings by Amrapali jewelers donning polki, small diamonds & South Sea pearls set in silver & gold. 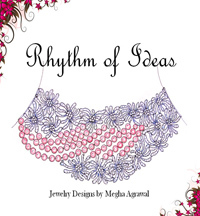 Filigree work on the sides makes it light-weight and comfortable to sport without hurting earlobes. Dangling center pearls will appear delicate while swaying with movement of head. 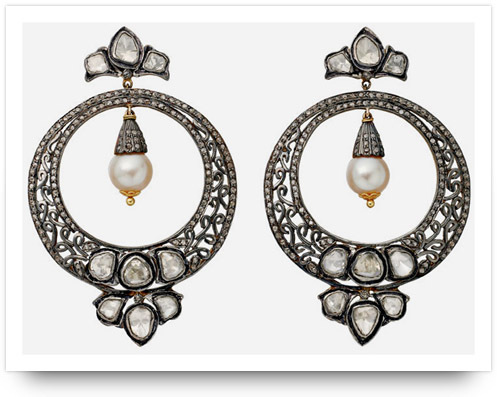 All in all tender and trendy pair of earrings that can be coupled with ethnic as well as formal dressing. Wonderful conceptualization of this masterpiece (by Amrapali jewelers) gives it the lotus shape with carved rubies in the shape of petals. Necklace looks equally fascinating from front as well as nape side. Just notice the finishing touch on the fastening joint with due attention given there too. 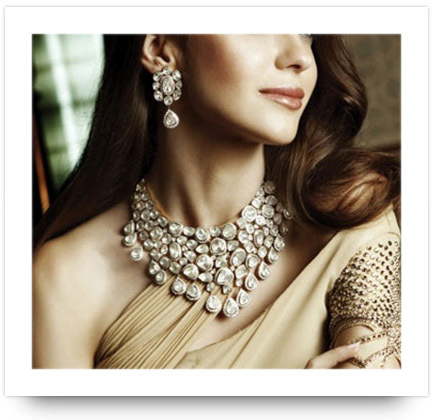 Imagine the subtlety the three kundan drops slinging down the nape will bring. However, make sure to up-do your hairstyle to make it visible. 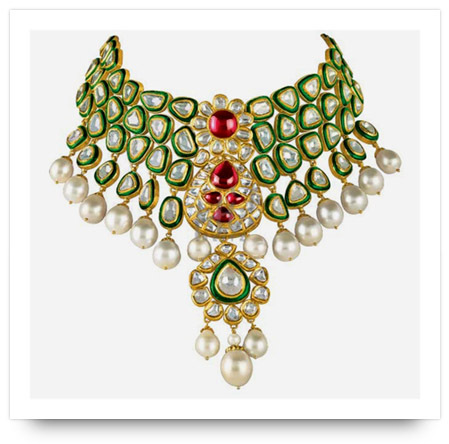 Crafted in 18K and 24K gold, necklace by Anmol jewelers is embellished with emeralds, rubies, south sea pearls, uncut diamonds and rose cut diamonds. 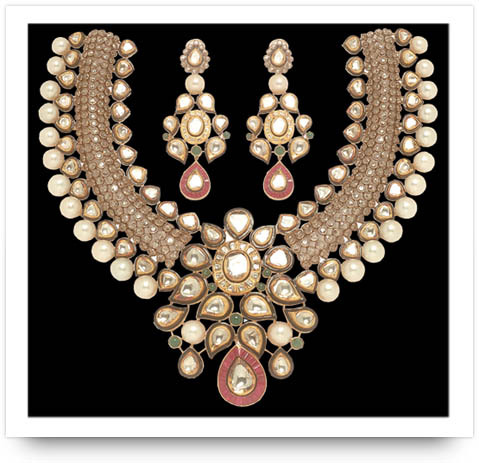 Oval shape is created at the center with surround of channel-set tapered kundan pieces. Let me tell you, channel setting of kundan pieces is never an easy task and requires expert craftsmanship. Beautiful use of rose cut diamonds on the sides has created a base to fix kundan and pearl. Contemporary touch with traditional setting will make it suitable for most of the outfits. This hand-cuff by Birdhichand Ghanshyamdas' "Aks" collection is truly in sync with time and surely desirable. It's a striking piece with alluring amalgamation of small round brilliants and uncut flat diamonds with textured gold in the center piece. Pair it with anything and everything. You will wait for the events to attend to show-off this piece :).